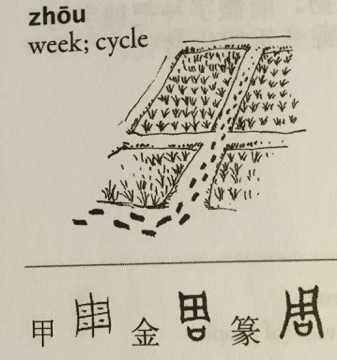 週/周(zhōu, week, cycle). 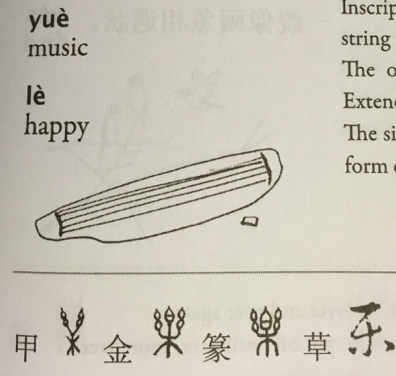 In the oracle-bone inscriptions the character consists of 田(tián) meaning field and four dots suggests crops planted in an orderly fashion in a field. The primary meanings are “circumference, “surrounded”, and “all around”. 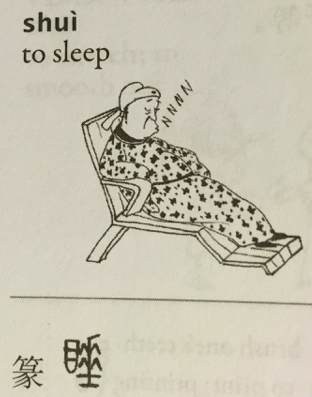 Extended meaning include “period”, “cycle”, and “week”. 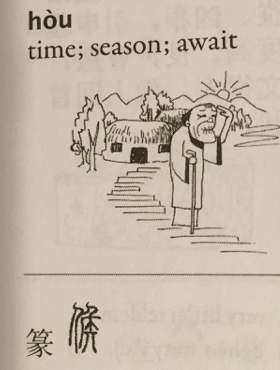 The walk radical 辶was eventually added to 周 specifically mean “week”. 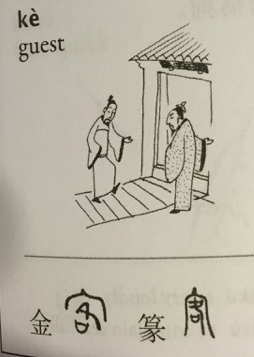 In Regular Script 土and 口 are found inside 门.The simplified character 周does not include the walk radical辶. 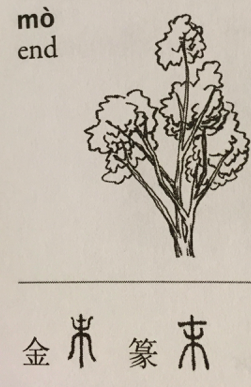 The character 末 (mò) consists of the radical 木(mù, wood, tree) with a horizontal stroke on the stop indicating the tip of a tree. The extended meaning includes “top” “end” “last stage” etc. Do not confuse with the character 未(wèi meaning future). In 末 the top line is longer than the lower line suggesting that there is no space for development; whereas in 未 the top line is shorter indicating that there is room for growth. It is 未(wèi) that appears in the character Mei meaning younger sister. 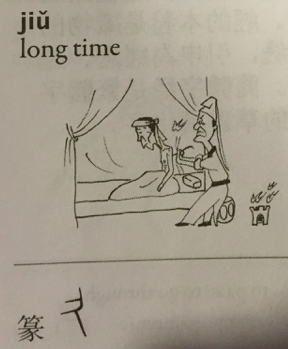 打 (Dǎ, to hit) – The character 丁(dīng) depicts a nail and originally meant "nail". 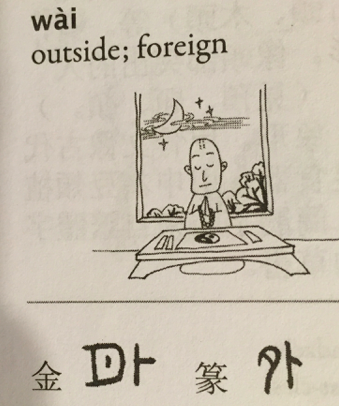 Later the radical 金(metal) was added to the left of 丁(钉). 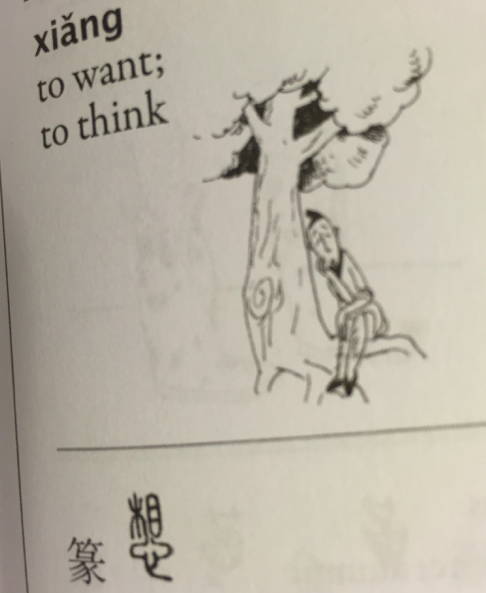 The character 打combines the hand radical 扌with the nail 丁, conveying the act of striking a nail with a hammer. 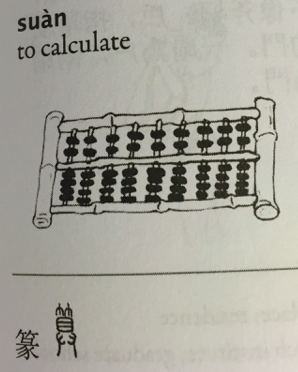 Hence 打means to "strike", "hit", or "beat" and its extended meaning include "to calculate", "to make", and "to play(a game)"etc. 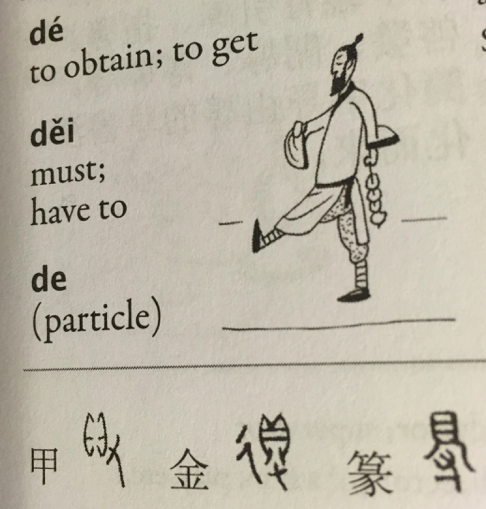 The character 球 (qiú)consists of the jade radical 王 and the phonetic component 求 (qiú, request). 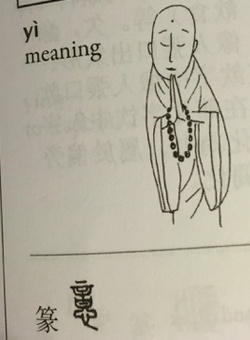 Its original meaning was "beautiful jade". 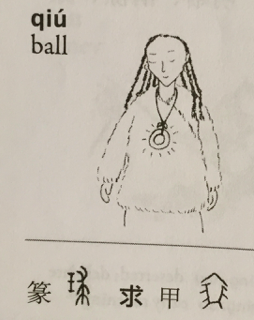 Later it came to mean "ball". In the Oracle-Bone inscriptions,求 is a pictograph of a fur coat. Since a fur coat represents warmth, shelter, and material comfort as things that people seek later came to mean seek request and beg. 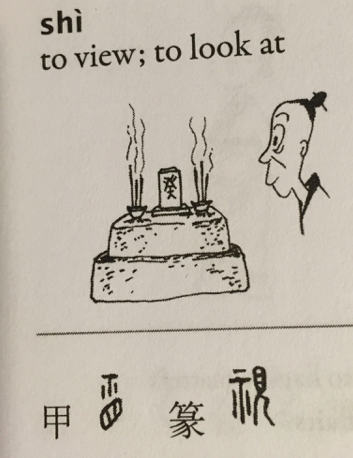 The character 看 (kàn) is the combination of 手 (shǒu, hand) and 目 (mù, eye) indicating the act of looking into the distance with a hand over one's eye. 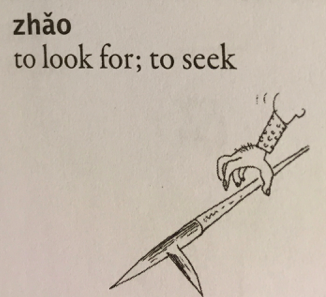 The original meaning was "look into the distance" and extended meanings include "to see", and "look at", "read", "visit" etc. 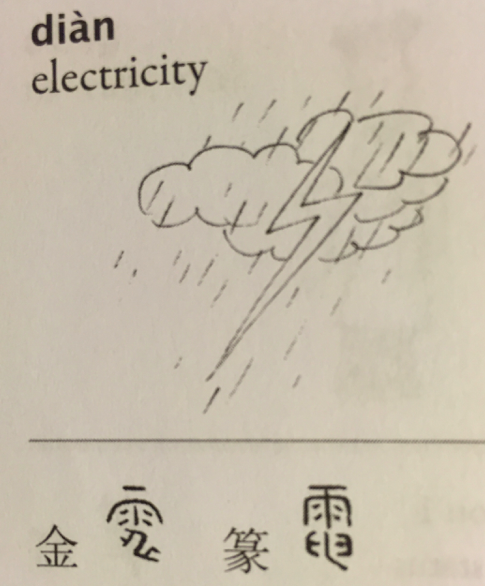 電/电(diàn, electricity) – In the Bronze inscription, the character 電has 雨 (yǔ, rain) in the upper part and 申(shēn, lighting) in the lower part, symbolizing lighting in a rainstorm. The extended meanings are "swift", "electricity" and "electric shock". 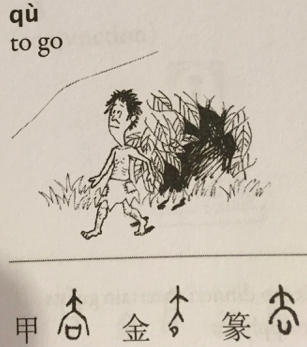 The character 申 resembles lighting streaking across a field with extended meanings such as "stretch", "express", and "state". 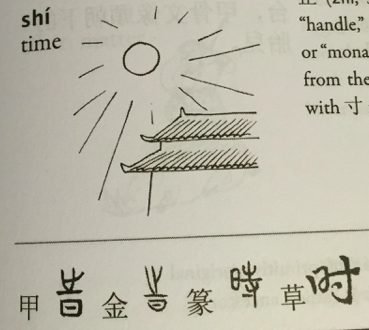 The simplified character 电 does not include the rain radical 雨. 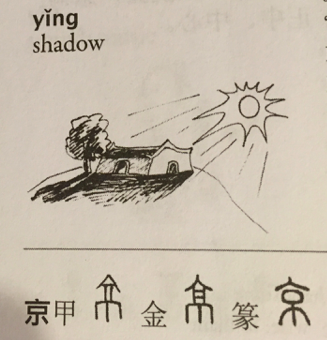 視/视(shì, to view, to look at) – The character 視 consists of the radical 礻(shì, show; alter) and 见(jiàn, see) suggesting acts of predicting future events according to astronomical phenomena. 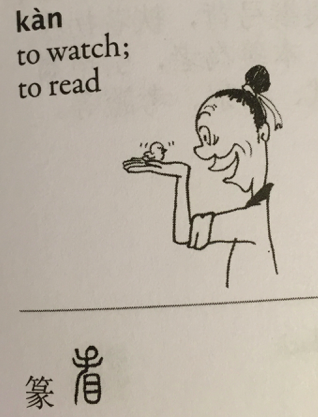 Therefore, it means "to view", "look at", "regard", "treat" etc. 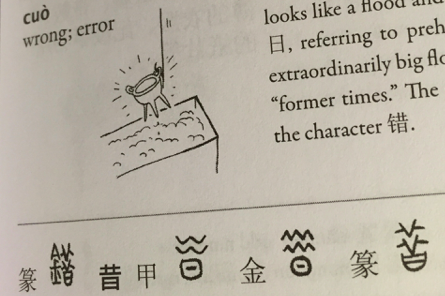 礻 is derived from the character 示. In the Oracle- Bone inscription, 示 resembles a stone altar upon which sacrifices are offered. 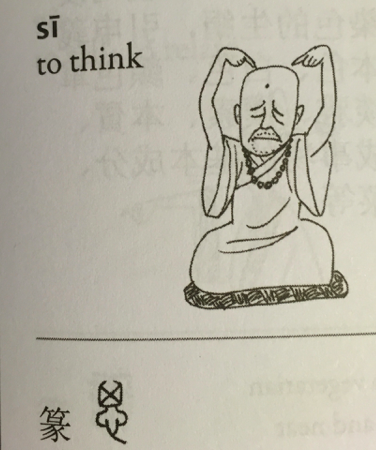 Hence, characters with the 礻radical are often associated with religious ceremonies or divination activities. 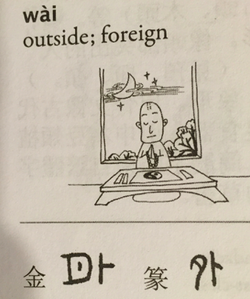 In the simplified version (视), the part 见 is in its simplest form. 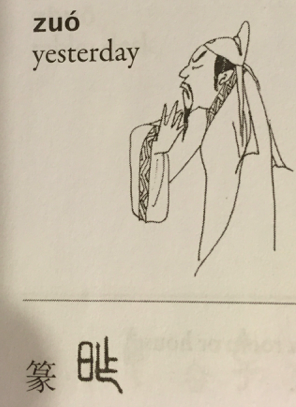 ​歌 (gē, song)- The character歌 is composed of the radical 欠 (qiàn, to yawn; breathe) and the phonetic component 哥 (gē, elder brother) meaning "song" or "sing". 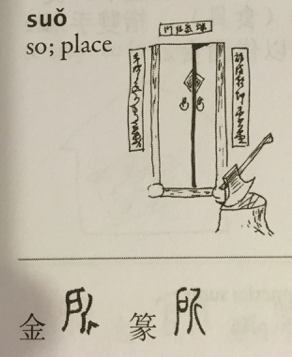 In the Oracle Bone inscriptions,欠 looks like a kneeling person yawning or breathing with an open mouth. 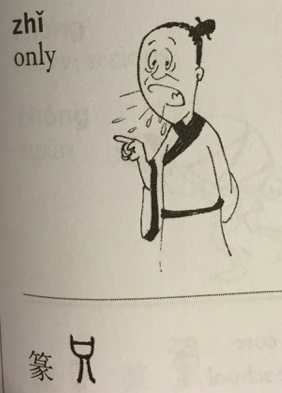 Characters containing 欠 often have something to do with the mouth， for instance (chūi, blow), 嘆息/叹(t​àn, sigh). 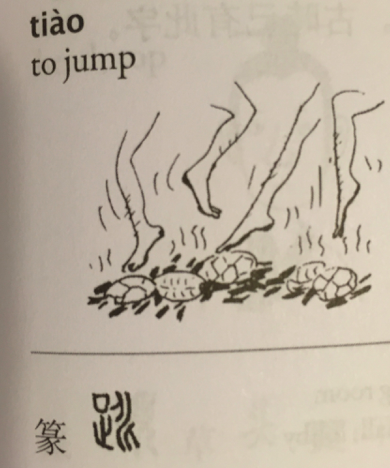 跳 (tiào, jump)- The character 跳consists of the foot radical ⻊and the phonetic component 兆 (zhào, omen; foretell). In its ancient form, 兆 resembles the cracks on an ox bone or tortoise shell after baking. Since a diviner would tell fortunes by reading crack marks on such shells， 兆 means “portend” or “omen”. 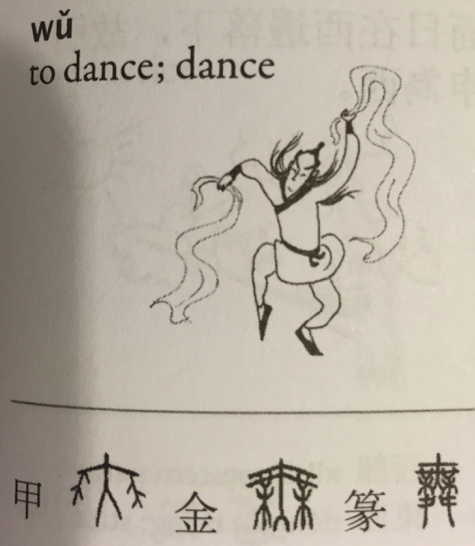 舞 ​(wǔ, to dance; dance) – In the Oracle-Bone inscription, the character 舞 looks like a person dancing with ox tails or ribbons in both hands. 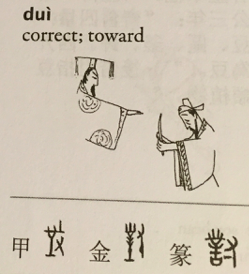 In Seal Script, 舛 (chuān, two feet) was added to the bottom of the character, indicating dancing with both hands and feet. In the Bronze Inscriptions and Seal Script, 舛 is a pictograph of a pair of feet，meaning “opposite” or “run counter to." 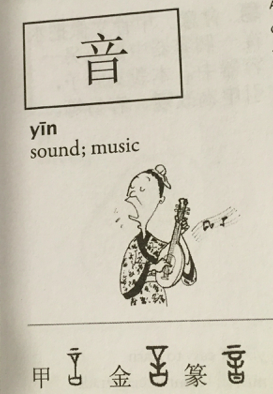 音 (yīn, sound; music) – 音 and 言 (yán) are cognate characters. In their ancient forms, both resemble a tongue sticking out from a mouth, representing a sound made by the mouth. 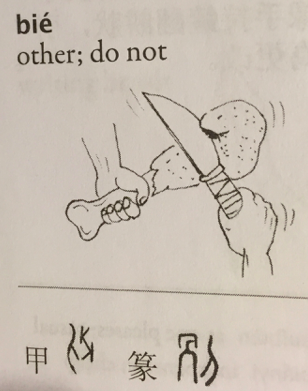 Later the two characters diverged in usage. 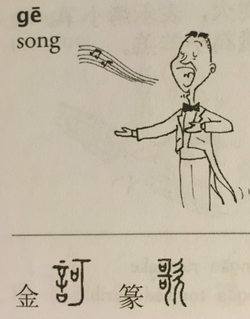 言 Refers to words or speech, while 音means (musical) sound. 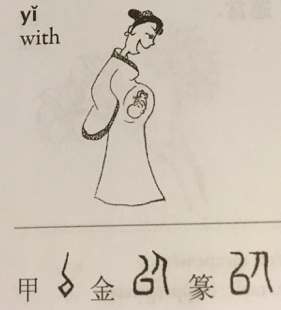 In Regular Script, 音 is the combination of 立 (lì, stand) and 曰 (yuē, speak; say). 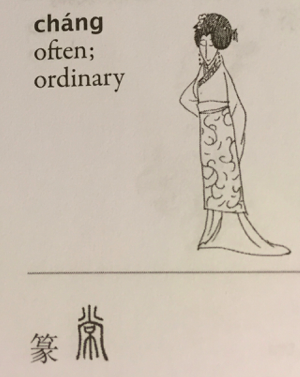 In the Oracle-Bone and Bronze Inscriptions, the character 立 depicts a person standing on the ground, and 曰 signifies sound coming out of the mouth. 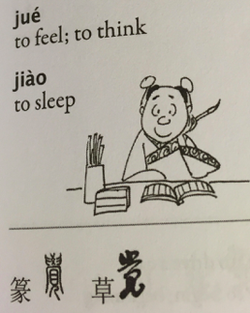 音 also appears in 識/识 (shì, to recognize.